This study was designed to investigate retrospectively the feasibility of transjugular insertion of biliary stent (TIBS) for the treatment of distal malignant obstructive jaundice complicated by coagulopathy. Between April 2005 and May 2010, six patients with distal malignant obstructive jaundice associated with coagulopathy that was unable to be corrected underwent TIBS at our institution for the palliation of jaundice. Patients’ medical record and imaging results were reviewed to obtain information about demographics, procedure details, complications, and clinical outcomes. The intrahepatic biliary tract was successfully accessed in all six patients via transjugular approach. The procedure was technically successfully in five of six patients, with a bare-metal stent implanted after traversing the biliary strictures. One procedure failed, because the guidewire could not traverse the biliary occlusion. One week after TIBS, the mean serum bilirubin in the five successful cases had decreased from 313 μmol/L (range 203.4–369.3) to 146.2 μmol/L (range 95.8–223.3) and had further decreased to 103.6 μmol/L (range 29.5–240.9) at 1 month after the procedure. No bleeding, sepsis, or other major complications were observed after the procedure. The mean survival of these five patients was 4.5 months (range 1.9–5.8). On imaging follow-up, there was no evidence of stent stenosis or migration, with 100 % primary patency. When the risks of hemorrhage from percutaneous transhepatic cholangiodrainage are high, TIBS may be an effective alternative for the treatment of distal malignant obstructive jaundice. 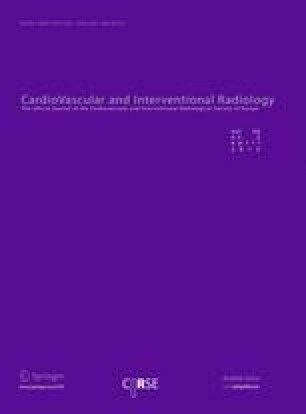 We thank Chinese Interventional Radiology Club (CIR Club) for the manuscript preparation. This paper is supported by the Natural Science Fund of China (Grant No. 30770984 and 81171444).